interminable fat tremolos running along the neck and swooning german old biddies. 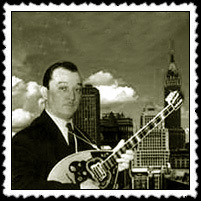 Trichordo bouzouki provides a delicious open tuning (D-A-D), neither major, nor minor, allowing sweet oriental combinations. Four-course bouzouki (8 strings) is tuned D-A-F-C, like the 4 first strings of the poor occidental guitar. Tetrachordo bouzouki was obviously created to play greek rumba and turkish bolero. This is injurious to our ears. Playing the trichordo bouzouki gives you the indescriptible pleasure to chisel the melody on the length of the neck while free sympathetic strings are still sounding. Trichordo is for warriors. On a tetrachordo, you play transversally to the neck with lazyness, like doing some knitting. Tetrachordo is for show-off. Whereas the trichordo bouzouki is a thin, light, smart and simple weapon, the tetrachordo is kitsch, pearly and sequined, with a broad and unesthetic neck. Tetrachordo players have tons of golden rings on their fat fingers. This is injurious to our eyes. Trichordo is the rebels' instrument. It does not mind if you chop a taximi with 2 fingers only, you commit yourself. Tetrachordo was created by a postmodern devil, to get bouzouki players involved in a celerity challenge. Not to play Rebetiko. This is injurious to our morals. Other sources declare that a banjo player, named Stefanakis, had the bad idea to create the monster, after the Second World War. However, all agree to accuse Manolis Chiotis to be the first having performed with a tetrachordo bouzouki. Furthermore, having electrified it. "Manolis Chiotis, the first and maybe unsurpassed bouzouki virtuoso, added a fourth string thus making the tuning identical to that of the first four strings of the guitar; this made easier the guitar-like accompaniment to the virtuoso performance. Furthermore, he introduced the electric bouzouki in order to increase the volume, since the rebetika songs were now performed in huge, luxurious ball-rooms and in front of large audience. The vast amount of recording productions affected and altered the old, authentic style and quality unavoidably started to decline. From 1960 onwards, commerce and easy profit debased rebetiko." Please note that the proud man fattened, subsided, exactly as the neck of the bouzouki. 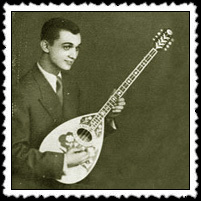 * some people sent a mail to make us notice the 1938 Chiotis bouzouki is a tetrachordo. Nada ochi niet! As many of them, this is a real trichordo bouzouki with a 8 keys mechanics (probably adapted from a mandolin) using only 6 of them. Look at the rosette, there are only 3 (pairs of) strings. AN EVIL BOUZOUKI FOR SOAP REBETIKO ? "The MIDIBUZ incorporates the traditional features of a classic eight string bouzouki, yet offers the versatility and endless combinations found in a synthesizer." More, some italian luthier builds tetrachordo baglamas now !! What is going to happen now ? techno rebetiko ? double neck bouzouki ? Multiplex teke shows ? Want to take a look to me playing outi with my friend hippo? Or a narcissic picture of me at the baglamas (80ko)? We have two goals : Dechiotification and Detetrachordization. Autodafe : we scratch CDs by Chiotis with an awl. It makes a bad grinding noise to the ears, but still better than Mairi-Linta lyrical meowings. I personally caught my own disk by surprise and bent it until it burst into a sparkling cloud of silver needles. Sacrifice : we cut the superfluous strings of the four-course bouzouki with strong swedish scissors (travel scissors for the tetrachordo baglamades). I personally had my first bouzouki (made in Italy (!) and tuned D-A-D-A :) have a frontal shock on a wooden corner. It was like smashing a watermelon with a sledgehammer, great pleasure. or even a photograph of those items certified by authorities.